Sometimes we need show our post as more users as possible (for example, challenge announcement) and we can reward all users for that which resteem your post. 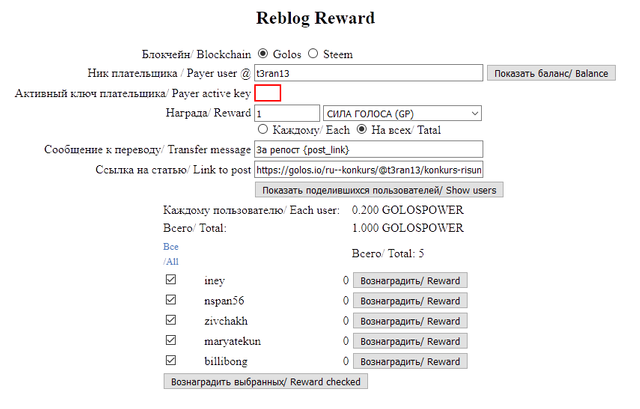 This simple tool will help you reward users for resreem/reblog on STEEM or GOLOS blockchain. Fill fields and press "Show users"
Reward all users by pressing "Reward checked" or each user by "reward"
You can fill only 1 field "Link to post" to see all users that resteemed post. If you want reward them you have to fill "Payer user", "Payer active key", "Reward", choose "Reward types" (for example, STEEM POWER) and check how to send reward - "each" user or "total" rewafd for all users. Your "Payer active key" you can see in "wallet"-->"permissions"-->"SHOW PRIVATE KEY" of your account on steemit.com. Hey @t3ran13 I am @utopian-io. I have just upvoted you!